An evaluation for the renovation of two 1.5 MG Concrete Storage Reservoirs is scheduled to be conducted soon. An evaluation of the existing Lakeview Drive SPS pumping capacity to handle stormwater flow and eliminate SSO’s is complete and an engineering report has been submitted to the Owner. Design is complete and the Owner has installed a new Permanganate Feed at the Raw Water Intake. The Capacity Assessment Plan, Sewer System Evaluation Survey Work Plan, Fats, Oils and Grease Control Program, Sanitary Sewer Overflow Response Plan, Pump Station Operation and Preventive Maintenance Program, Continuing Sewer System Assessment Program, Infrastructure Rehabilitation Program, and Information Management Systems and Capacity Assessment Report are complete and approved by EPA as part of the Administrative Order of Consent. The WCTS Remediation Plan has been submitted to EPA for approval. A preliminary Engineering Report for application for a CDBG was submitted to South Central Development District for the Santa Fe SPS Rehab project. 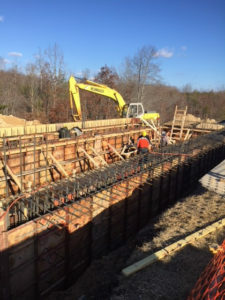 Improvements at the Meadow Park WTP and Holiday WTP, which include constructing a new chemical building, as well as sandblasting and painting the pipe gallery, and replacing the existing settling basin equipment, began November 2017 with W&O Construction Co., Inc. being the Contractor. Currently, the Contractor is placing concrete for the chemical building slab as well as painting the pipe gallery. A completion date of May 26, 2018 is scheduled. The Meadow Park Water Treatment Plant Generator Project with Trinity Contracting Services Co., LLC is underway with the first two generators initially installed and operating and the third generator added by a change order and installed in late February. A study to determine the alternatives to supply the future raw water needs of Crossville has been presented to the Owner and appropriate regulatory agencies will be contacted to review the four alternatives as presented. A kickoff meeting was held February 1 related to design of 6,000 L.F. of 10- inch water line and 16,000 L.F. of 4-inch low pressure sewer. This project reinforces the water transmission system as well as providing sewer service to the Meadow Park Lake area. Design of the new $15.2M 4.0 MGD SBR WWTP and Third Avenue gravity conveyance line are underway. Property survey is underway and geotechnical work is scheduled. 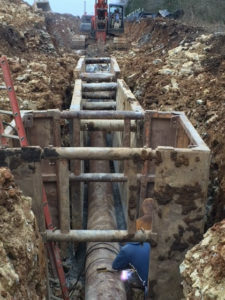 Construction on the Industrial Park Water and Sewer System Improvements project, with Mayse Construction Company of Chattanooga, TN, is underway. The $503,092 improvements consist of 2,370 L.F. of 10-inch sewer and 2,575 L.F. of 16-inch water line. A completion date is scheduled for March 11, 2018. A preliminary Engineering Report for application for a CDBG was submitted to Southeast Tennessee Development District for sewer rehabilitation. Plans and Specifications are complete for the State Route 30 utility relocation. TDOT is currently acquiring right of ways. Preliminary work is underway for water supply to the Summer City System consisting of 16,000 L.F. of water line, a 750,000 gallon elevated storage tank, and 2-2,100 GPM booster stations. A grant application is in process. An application for a $1M ARC grant was submitted for a new 500,000 gallon water tank and 16-inch water line. The Highway 127/62 utility relocation project through TDOT has a letting date of February 2019. Design work is underway. Bids for the 12-inch Water Transmission Line from FCUD’s Clarkrange Tank to the Industrial Park were opened January 24 with John T. Hall Construction, Inc., of Sparta, TN being the low bidder at $376,717.05. The project is being funded through a TN ECD Site Development Grant for the Fentress County Industrial Development Board. The semi-annual report has been submitted for the pre-treatment program. A contract for SCADA System Upgrades has been executed and draft specifications are underway. Improvements to the South WWTP Aeration Basins are underway with the Contractor working on Basin 4. The reinforced concrete slab has been placed, diffusers installed, and the side slopes are being prepared for liner installation. 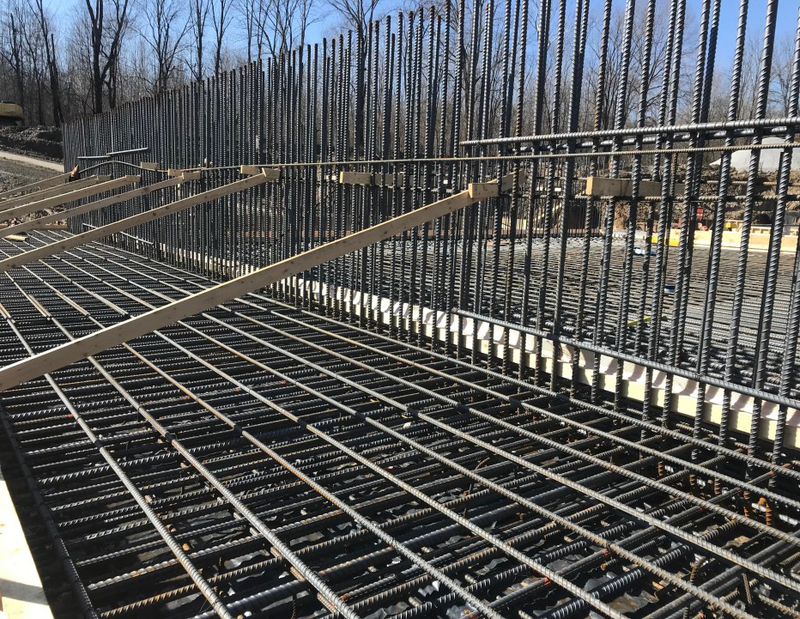 This project includes the renovation of three existing earthen aeration basins with 60 mil synthetic liner system on the side slopes, poured in place concrete bottom slabs, new inlet and outlet piping and basin underdrain system. Nine-inch fine bubble disc diffusers are designed to be attached to the concrete bottom slab. The Contractor is M. Bowling, Inc. of Henderson, KY. This $3.2 million project has a completion date of August 2018. Construction of the North Wastewater Treatment Plant Final Clarifiers No. 1 & No. 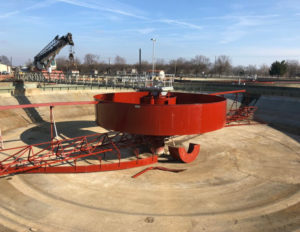 2 Rehabilitation project is continuing with the contractor, M. Bowling, Inc. Clarifier No. 1 and Clarifier No. 2 equipment has been installed and electrical work is underway. The Contractor plans to complete the $764,241 project by March 31, 2018. Draft plans for the South WTP Backwash Pumps have been submitted to the Owner for review. Draft plans for the South WWTP Instrumentation and SCADA Upgrade have been submitted and reviewed with the Owner. A Preliminary Engineering Report for application for a CDBG was submitted to South Central Development District for an electrical upgrade to the Swan Avenue Well and to continue water system leakage rehab. Lewis County, in partnership with Hohenwald, was awarded a $525,000 CDBG for continuing water system leakage rehabilitation at Cane Creek Road, S. Oak Street, and replacement of residential service lines. The Buffalo Road water line is being replaced due to the city continuously repairing leaks; construction is expected to be complete June 2018. This project is being funded by an ARC Grant in the amount of $500,000. Ward Construction of Linden, TN, was the low bidder at $396,120. The 2016 CDBG Water System Rehabilitation project is complete. 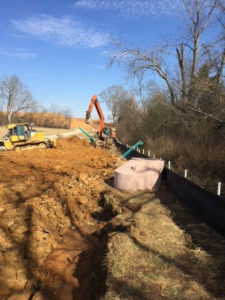 Construction for the $1,007,405 sewer extension to Farm Credit Services, which will accommodate future growth, is underway with Cumberland Pipeline, LLC being the Contractor. The Contractor is working on finishing the gravity sewer and wrapping up the new 180 gpm Sorrell Lane SPS. The project has a completion date of April 2018. A design progress meeting for the Hammond Wood WWTP Expansion and Renovation was held in January. Draft Geotech report has been reviewed and a sinkhole risk study was recommended. Electrical, structural, and mechanical design is underway. This $35 million project includes a new influent pumping station with coarse screening, headworks with fine screening and grit removal, anaerobic zone with submersible mixers for enhanced biological phosphorus removal, renovation of the existing oxidation ditches, fine bubble aeration and submersible mixers, new 110 foot diameter final clarifier, renovation of the existing return activated sludge pumping station, renovation of the existing chemical feed facilities, and permanent chemical feed facilities for peracetic acid disinfection. 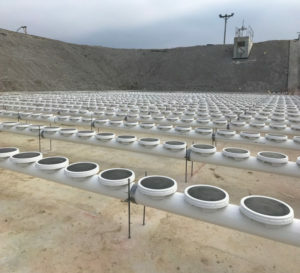 Biosolids are proposed to be stored in two 750,000 gallon aerated prestressed concrete sludge holding tanks before being dewatered by screw presses and solar dryers resulting in a class “A” product. A new operations and laboratory building is also being designed which includes facilities for operator training. Tyson Foods recently announced their $300M investment to locate in Humboldt. This announcement requires a larger WWTP as well as improvements to the water distribution system. Design work is underway for the new 5 MGD Wastewater Treatment Plant and water distribution improvements. An application for a Site Development Grant through TN ECD has been submitted for sewer service to the industrial park. An application for a grant through Economic Development Administration (EDA) has been submitted for the water system improvements. Grant funding of $1.5M has been received from EDA for the wastewater treatment plant. Additionally, a $525,000 CDBG was awarded for improvements at the wastewater treatment plant. An application for a Site Development Grant through TN ECD has been submitted for sewer service to the Industrial Park. The NPDES renewal permit has been issued. Grant funding for the $1.5M Sludge Dewatering Facility was received through EDA which includes influent pumping station, grit removal, and sludge dewatering. Design has started. A $525,000 CDBG was awarded for Sewer System Improvements. A scope change was submitted and approved by ECD. Design work is underway. A preliminary engineering report and application has been submitted for inclusion in the 2018 CDBG funding. A preliminary engineering report is being submitted for FastTrack funding for the replacement of the Buena Vista Road sewer pumping station. Design is continuing on the $13.3M Disaster Community Development Block Grant focusing on five separate projects. The first project, 54-inch Riverside Interceptor Rehabilitation, recently bid with Layne Inliner, LLC of Orleans, IN being the low bidder at $964,266. Commence work date is scheduled for May 15th. The Johnson Creek and SFFD River SPS renovation project is currently out for bids and will be received on March 29. Design continues on the Miller Avenue Wastewater Treatment Plant Improvements and the water line river crossings. A final report for renovation of the 8.0 MGD Water Treatment Plant has been submitted to the Owner. Plans and specifications, the Facility Plan, and supporting documentation for the WWTP Nutrient Removal Facilities were submitted to SRF and TDEC. A Water System Capacity Study is complete and has been submitted to the Owner. Construction of water and sewer relocations for State Route 50/431 continues with the west half of water installed and a small section of west sewer remaining. The east half of the water is 80 percent complete. A CDBG was awarded for Sewer System Improvements in the amount of $525,000. A pre-construction meeting for the Snell Branch Sewage Pumping Station Renovation project with Richland, LLC of Pulaski, TN being the low bidder at $1,059,850, was held January 31. Construction for the Monroe Water System Improvements project, withJohn T. Hall Construction of Sparta, TN being the lower bidder at $1,562,395, has begun. The project consists of 33,000 L.F. of 6 and 8-inch water line and has a completion date of September 2018. Construction for the Sewage Pumping Stations Renovation project, with John T. Hall Construction of Sparta, TN being the low bidder at $473,850 is underway. The project consists of the renovation of two sewage pumping stations and 1,400 L.F. of sewer line and has a completion date of July 31. Draft plans for the WWTP project, funded by a CDBG, have been submitted to the Owner. Improvements at the Water Treatment Plant are underway with Southern Flow being the Contractor for control and instrumentation modifications at a cost of $151,000. In addition, the City Lake Dam repair is complete with GeoFirma as the Contractor. A bid opening for 10,000 L.F. of new 6 & 8-inch water lines, a booster station, and new 250,000 gallon elevated tank for the new north high pressure zone was held February 20. The low bidder for Contract 17-01 was Bobby Luttrell & Sons, LLC at $675,446.50 and the low bidder for Contract 17-02 was Phoenix Fabricators and Erectors, LLC at $734,500. 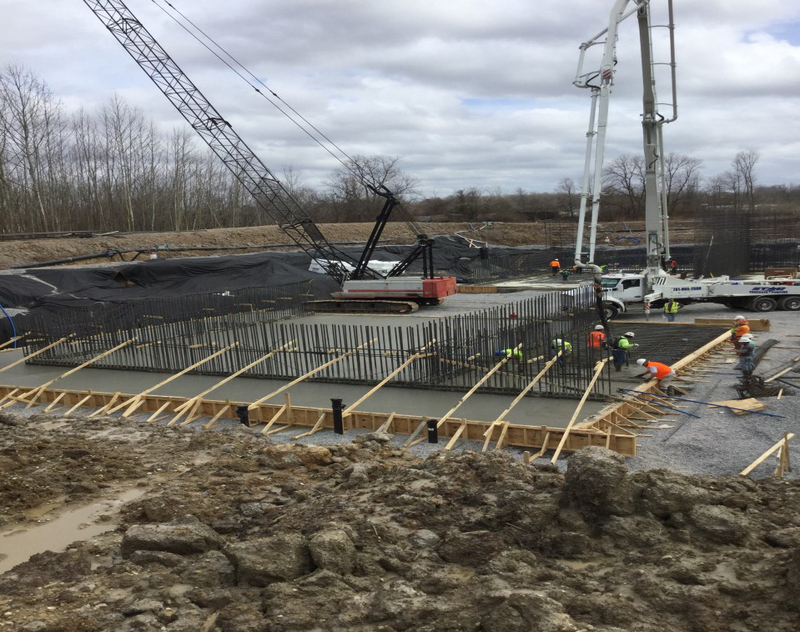 Design of a new Sludge Thickener Building and two new belt presses is 50 percent complete. A preliminary Alternative Disinfection Study is underway to investigate the use of alternate disinfectants and technologies at the WWTP. Preliminary work is underway in relation to the disinfection change of switching from chlorine gas to bleach at the WTP. Plans and specifications have been submitted to KDOW and approved and KIA approval is pending for the Hoover Hill Interconnect Water Line project. This project is scheduled to bid March 20. A design review meeting has been conducted for the 15 MG Tank. This tank is proposed to to store wet weather combined sewer flows and will utilize a deep file foundation. The Industrial Wastewater Survey (IWS) and calculation of the Plant Protection Criteria and Industrial Wastewater Discharge Limits (local limits) have been submitted to TDEC for approval. Commence work for the $357,519 Harwell Heights and Robinhood Sewage Pumping Station Renovations is scheduled for March 5 with Contractor B. H. Craig Construction. Commence work for the $394,279 rehabilitation of approximately 5,000 L.F. of gravity sewer using pipe bursting methods is underway with Contractor MG Underground, LLC. The project’s completion date is May 3. Phase II of the TDOT State Route 128 road widening is under construction with Contractor Marbury Construction. A completion date of December 2018 has been set. The water portion is complete and the sewer portion has just begun. Final plans have been submitted to TDOT for the SR128 project from Pyburns Road to Airport Road. A NPDES Permit Renewal Application was submitted to TDEC. A preliminary Engineering Report for application for a CDBG was submitted for sewer rehabilitation. Design is complete for the WWTP Influent Forcemain Replacement project which bids March 23. The City is awaiting the NPDES Draft Permit from TDEC to review before submitting the IWS and Local Limits. The IWS and Local Limits have been submitted to the State for preliminary approval before adoption. Design for the 2017 Phase III Sewer Rehab project is underway. A design review for the rehabilitation of the Shoffner-Bomar SPS and US Pencil SPS was conducted with the Owner. The $2.8M renovation of the 2.16 MGD SBR Wastewater Treatment Plant is complete. Technical assistance continues to be provided for pretreatment. A preliminary Engineering Report for application for a CDBG was submitted to Upper Cumberland Development District for a Sewer System Rehab project. Smith Contractors was awarded the $8,888,000 new 1.6 MGD Sequencing Batch Reactor (SBR) Wastewater Treatment Plant. The Contractor has excavated approximately 65 percent of the SBR tanks and poured two base slabs. The project has a completion date of March 2019. The Annual Report for pretreatment has been submitted. Design and the TDOT permit are complete for the Eaton Street Sewer project. A preliminary Engineering Report for re-application for a CDBG was submitted for a Sewer System Rehab project. Utility line relocation plans for the I-69, Phase II and State Route 5 have been completed and are awaiting TDOT’s letting. A FastTrack grant for an Industrial Park Water Line with Natural Gas Piping Co. being the low bid of $326,565.50 is nearing completion. A Delta Regional Authority Grant has been awarded in the amount of $350,000 for water improvements to the Industrial Park.